How Many Calories Are There in a Dosa & What Are Its Health Benefits? Dosas are thin, pancake resemblances native to India, prepared from lentil and rice batter. Dosas are rich in carbohydrates as well as fats. Dosa is a popular staple food of South India & are considered healthy due to their low calories. It is a heart healthy food as it contains less amount of saturated fat. Only 2 grams of the fat is saturated, which is beneficial, as too much saturated fat can increase your risk of cardiovascular diseases. Health Benefits: Dosa is an Indian homemade food which is a rich source of carbohydrates. Dosas are moderately high in protein. Protein helps build muscle and may help you slim down more quickly when you consume a reduced-calorie diet. Dosas also consist of probiotics which keep your gut healthy & also has traces of iron, calcium and vitamin C. Another big plus about this South Indian Delicacy is that they are easy on the stomach and gets digested pretty easily. Dosa is consumed with sambhar which is a popular Indian curry combined with cereals. It is tasty, spicy and low on calories. Sambhar is part of the vegetarian Indian recipe prepared from pulses, yellow split pulses, lots of spices such as cumin, turmeric, curry leaves and several vegetables.The lentils provide protein and the veggies are the source of fiber. 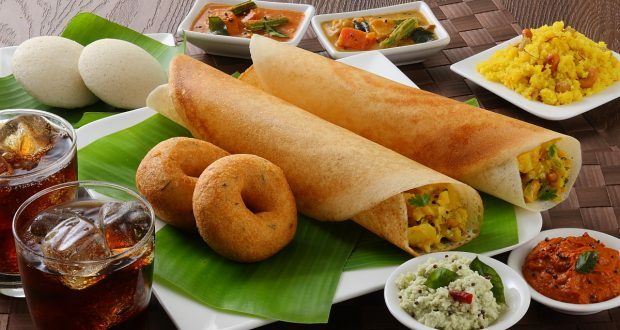 Dosa is not just a typical South Indian food but also is a wide favourite of people across India. You will find Dosa almost in any Indian Hotel’s menu. Previous articleHow Many Calories Are There in Pav Bhaji & Does It Have Any Health Benefits? Next articleHow Many Calories Are There In A Medu Vada & Does it Have Any Health Benefits? How Many Calories Are There in Thandai & Does It Have Any Health Benefits?